To me that photograph is like a scene from a family movie when the DVD player has stopped. I have only to look at it, close my eyes, and the player starts again, everything becomes alive, and the rest of the Walmsley Society members crowd around. A gathering of friends to celebrate the life and writings of Leo Walmsley, and the life and art of Ulric Walmsley. I couldn’t resist this flagrant plagiarism from Sound of the Sea, not just because it’s one of the most memorable openings of a novel, but because it’s so apt a metaphor to reflect on the 21 years that the Walmsley Society has been in existence. And I can still hear, loud and clear, the beautifully rendered Yorkshire accents of the ‘Society Reading Team’ (now Neville, Keith, and Marilyn, originally Jack Stead also). Every time I attend the AGM, and listen to Neville as he opens the meeting, I’m taken back to those performances, and it brings tears of joy to my eyes. 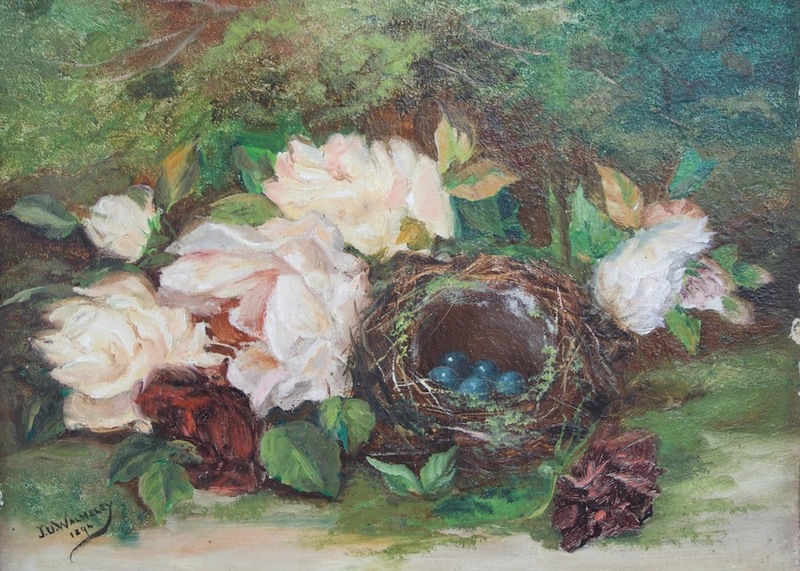 I also admit to unhealthy desires to own, rather than simply view, some of Ulric’s paintings on display at Society meetings. 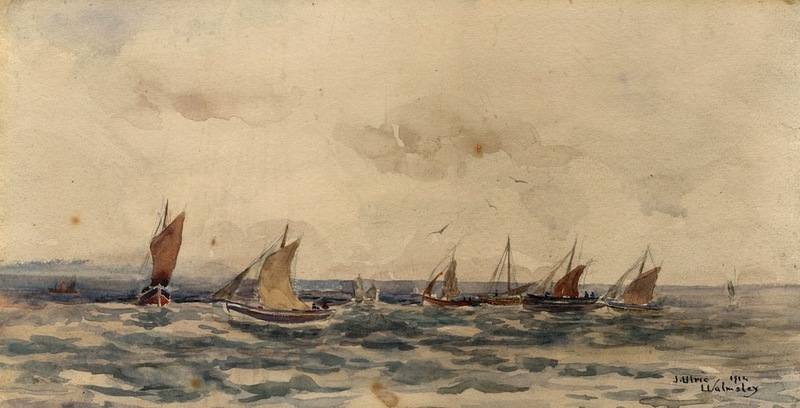 Through the generosity of my cousin Sheila, I have a good sample of Ulric’s paintings, and a while back acquired a water-colour of Bay from its unsuspecting owner in Ohio, thanks to a tip from Marilyn. I used to comb second-hand bookstores for hours, looking for one of Leo’s rarer books, only to find the umpteenth copy of British Ports and Harbours (did the printers mistakenly print 200,000 when only 200 were ordered?) but never found a single copy of The Green Rocket, or Toro of the Little People. But I did find a book by Leo, called Approaches to Drawing, unique to my collection, mostly because it was written by a Leo Walmsley I’m not related to! I kept thinking, as I pored through the shelves of a tumble-down barn in northern Vermont, that I’d find one of these gems, and then open it up, and see, in Leo’s unmistakable handwriting, an inscription—“With love to Mother, Oct. 1921”—but it was not to be. But that was then [see below]. Now, thanks to AbeBooks and other internet bookstores, I have a complete collection of Leo’s books, a second collection nearly complete for my daughter Katharine, and the beginnings of one for Jonathan, if and when he gets the ‘bug.’ I am now working on a collection of signed first editions. I share all this for a reason. Like so many other Walmsley Society members, I’ve been drawn closer to both Leo and Ulric through the Society in ways that would not otherwise have been possible. But my situation is completely different, even from my brothers and sisters. I’m the only one in my immediate family who never met Ulric, despite the fact that he lived until I was eleven years old. And I barely spent a year’s worth of days with my father. Yet through the Society, I’ve not only met my grandfather and father, I’ve spent time with them, and with each passing year, spend more time. You shouldn’t be taken aback, then, that I want to be surrounded by their work, and pass them on to my children, and they to theirs, so they, too, will be able to spend time with Leo and Ulric. 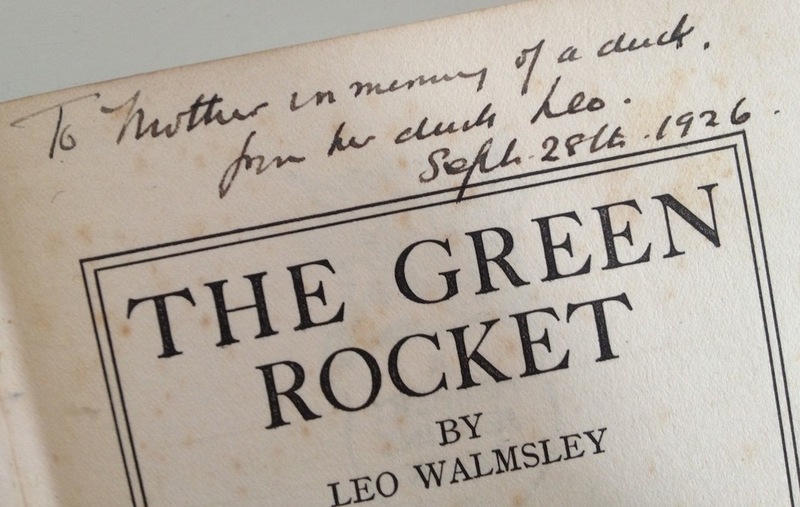 Without the Walmsley Society, Leo and Ulric would be fading memories with every passing generation. Many of you have met my daughter Katharine, now a first-grade teacher in Holyoke, Massachusetts [update: now a second-grade teacher in Northampton, MA]. At the first meeting of the Society we attended together, when she was sixteen, she whispered to me, “Dad, they’re obsessed!” little realizing that she would be drawn in, too. Don’t be surprised if Katharine someday pens a biography to be added to the Walmsley collection. Remember her poem, A Bright Stone, published in the Autumn, 2004 Journal—she’s Leo’s and Margaret’s grand-daughter, make no mistake! Before I outstay my welcome in the Journal, I want to pay my homage to Jack Hazell, whose crazy idea it was in the first place to found the Walmsley Society. 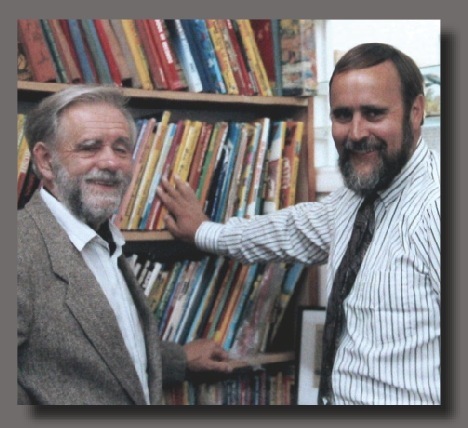 Jack has said that the photo of him and me (the one where I’m holding up the bookcase) was one of his prized possessions. Jack, it’s one of mine, too. You founded a gathering of friends that has blossomed into a Society that meets every year, and celebrates not just Leo and Ulric, but also the friendship of those who gather. We’ve lost you, and we’ve lost others, but you are still with us, and so are they, as we make our annual pilgrimage to Robin Hood’s Bay or trek to Cornwall, or seek out one of Leo’s many domiciles, or uncover new stories, or come across old photographs, or marvel at an Ulric painting we had never seen before. Every year, there’s something new to learn, and another little piece of the Leo and Ulric puzzle fits into place. What Jack started, others have continued, and now when I return to Robin Hood’s Bay, it’s not just to learn more about Leo and Ulric, it’s to join hands again with old friends and to meet new ones. So, until we meet again, Neville and Elizabeth, Jane, Marilyn, Nona, Fred and Gwen, Graham and Margaret, Keith, Stephanie, and all the Society members—too numerous to mention by name, but each of them friends—who steadfastly keep alight Jack Hazell’s dream of 21 years ago—happy 21st, and thank you from the bottom of my heart.